As I have already mentioned, learning is always ongoing. It begins from Day One. And just like socialization, learning can happen either passively or actively. With passive learning, and by that I mean, learning that happens by chance, there is a possibility that your puppy will learn inappropriate behaviors in his efforts to achieve the things he needs and wants. With purposeful active learning through training, learning is supervised by the human to ensure that the puppy learns only appropriate behaviors. Therefore, early training is important for all puppies so you can direct the puppy towards learning appropriate behaviors, rather than learning inappropriate ones which you may have to correct or re-train. Training is something you can and should learn to do yourself because it is you who are sharing a life with this puppy, and you who, therefore, has continuous influence over his learning. As previously explained, your puppy’s priority will be looking out for his own interests. As you spend more and more time with your puppy, you will be better able to tell what his motivations are. Whether it be food, toys, or activities, your puppy being an individual will have his own preferences – favorites, if you will – with some puppies being more specific than others. There will also be the motivation to avoid certain things perhaps because of fear or discomfort at their presence. Knowing this about your puppy will help you identify things in your home that will motivate him towards certain behaviors. Furthermore, you’ll be able to control these as potential rewards, or remove them if they act as distractions to your training. Before you proceed with training your pup, be clear about your objectives, determine what rules the puppy ought to learn to follow around the house and elsewhere, and define what good behavior and success look like so you can reward it when it is presented. More often than not, we spend considerable time noticing bad behaviors and the mistakes our puppy makes, but put little thought in what it means for us that our puppy should be well-mannered and obedient. Therefore, while we can easily identify the problem and its effects, we have difficulty in formulating solutions because we don’t know exactly what puppy behaviors would make life easy for us. By now, you know how quickly a puppy can passively learn ways to achieve his needs and wants during every day experiences, therefore be vigilant. Don’t let your puppy inadvertently learn any wrong lessons or bad behaviors from unsupervised interactions with the environment, or careless interactions with you. You are always “ON” with a puppy, because, during every waking moment, learning never stops. Furthermore, also be ever vigilant for opportunities to praise and reward good behavior when it is presented. We often always look out for the bad stuff and the mistakes, and let slip those moments when the puppy is doing something good and appropriate that you actually want to reward and reinforce. Your discipline in adhering to rules and schedules is a HUGE factor in determining how successful you will be with your puppy’s training. If you, your family, and/or anyone else who shares responsibility in caring for your puppy can be consistent with the rules and schedules you’ve put down, then you will avoid confusion and provide the puppy with much clarity and understanding. If rules change from one day to the next, or from one person caring for your dog to the next you can expect a lot of mistakes and failures on the part of the puppy that are in no way his fault. For example, if you have decided that, in your household, dogs are not allowed on the sofa, then all household members must enforce the same rule at all times, and not secretly allow the dog on the sofa when others are not looking. With few exceptions, most puppies do require some amount of effort to raise and train. So do not expect quick one-step-guaranteed-to-work-within-a-day solutions. Despite what you may have seen on television, most problem behaviors are not fixed after a few finger jabs and kicks aimed at your puppy, nor can new behaviors be trained to proficiency within the span of an hour-long TV show (unless perhaps your dog is a genius). Training requires practice and it requires that you generalize the trained behavior to a wide variety of scenarios so that the puppy performs despite distractions, and so that he learns that the same rules apply everywhere and even under different conditions. In short, do not to lose hope if you’ve spent only one afternoon training a new behavior with your dog and he doesn’t perform the behavior as well in a busy mall as he does in the quiet confines of your living room. Specific to the Pet Centrics training philosophy is that all parties involved, be they human or animal, should be willing participants that take joy from being in each others company. Training will feel like a chore much of the time, especially in the first few months of life with your new puppy. Mistakes will be made by the puppy as well as by you. At such times of mounting frustration, take a step back, regroup, and analyze how the mistake could have been prevented or handled better. But do not dwell too long on you or your puppy’s failures. Instead, celebrate the daily progress and the success that you achieve with your puppy. Armed with the proper knowledge and mindset, training your puppy will become an achievable AND enjoyable task. This concludes our Puppy Training Prep Course. You’ll be pleased to know that the information that I’ve shared with you is also what I introduce to all my training students as a foundation of the Training 101 course, the flagship course of Pet Centrics Dog Training. I looked for training facilities in Manila just for fun … I initially thought it would be ridiculous for me to become one of those pet parents who would send the dog to school. WELL, we all know how that turned out! 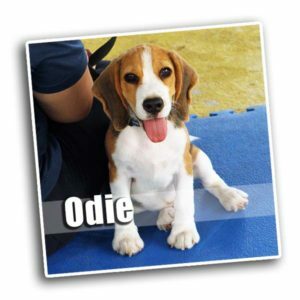 It was a time when Odie was learning to misbehave – he chewed on the plants, bit me to the point of (me) having lots of scratches on my arms, and was causing a riot no one knew how to control. This is how, after some time spent searching for dog training schools online, little Odie and his mom Pauline got signed up for one of my Pet Centrics Puppy Classes in October of 2012. Beagles can be a real handful and Odie turned out to be just that and WAY more! This little guy is fast, I tell you, and he can get into trouble in microseconds! He was definitely not an easy dog for an inexperienced dog owner like Pauline. Thankfully, Pauline – a self-confessed dog soccer-mom – proved to be incredibly dedicated and she devoted a huge amount of time training and exercising Odie. Pauline did a great job of applying the lessons I shared during classes, which includes the earliest versions of the 3-Step System for Puppy Training. As a team, Odie and Pauline worked really well together performing the required class exercises. I was able to help Pauline understand Odie, advise her on how to manage him, and teach her how she could develop their relationship and improve her control of his youthful energy through early training. I’m glad I was able to guide her through the most challenging days of living with a young and hyperactive little Beagle. Now an adult, Odie can still get into a lot of mischief. But, for then-newbie dog owner Pauline, I can say she did amazingly well with Odie. The two of them have, since their first course with me, completed intermediate and advanced levels of obedience. On top of that, these two have been on many adventures together including participating in numerous dog events and even appearing on TV! Odie is still a crazy boy, but I could only imagine how things would have turned out if we didn’t give him and ourselves proper education. 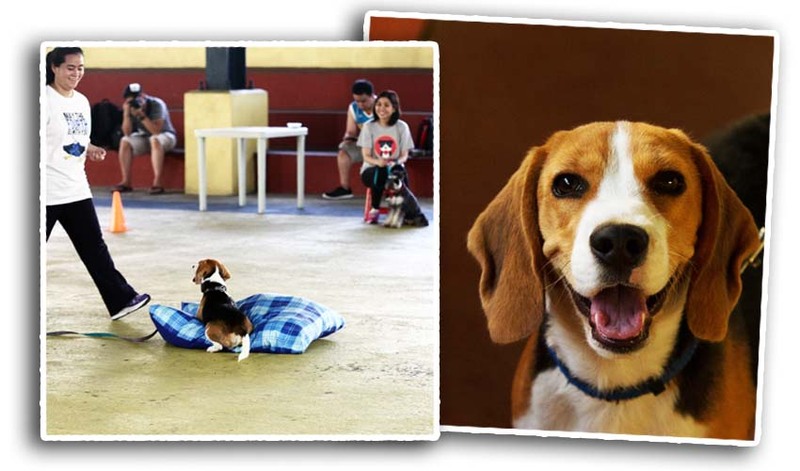 Odie has finished three Pet Centrics courses so far… He went on to become a “demo dog” for other (Pet Centrics) Basic Obedience students and for a TV spot! He’s not perfect, he’s far from perfect, but he’s definitely a better boy than most dogs, thanks to Doc Marose and Pet Centrics. Going to training has been a big part of Odie’s growth, having done so since he was a little over two months old. I didn’t know that even for a dog, education is the best thing that we could give.